The main article about WGS ends at around 1953, the year before I left. From then until around 1962, my main connections were attendance at the Old Scholars’ Reunions held in the School with dinner served in the dining hall. Attendance started to fall off, partly I think due to the Committee (which included my mother) failing to accept that times had changed. More restaurants and hotels opened for evening meals; the aspirations and expectations of many Old Students had beyond dinners in the school canteen and no bar provision. The last one which I attended was in 1961 or 1962. I’m told that some events were subsequently organised at Aston-Woodhouse High School but my comments refer to those at Woodhouse, based on my attendance at a number of them, feedback from fellow Old Students and on 'personal arguments' with my mother! I recall that a very successful dinner was held in 1959 in a Sheffield hotel to mark the 50th Anniversary of WGS. Major changes in the West Riding provision for post-eleven education occurred in the 1960's, changes which many Old Woodhovians were unhappy about. However, this is neither the time nor place to enter the world of education theory and politics. The outcome was that the Woodhouse site became part of Aston-Woodhouse High School, then the building given up by WRCC and all work transferred to the Aston-Woodhouse site. This, in fact, was neither at Woodhouse nor Aston but at Swallownest where it remains under its shortened name of Aston High School. Many of the staff from WGS transferred to the new site but the Head, Frank Pinion, moved on to the staff at Sheffield University. One question which exercises the minds of many Old Woodhovians is the fate of the of the Honours Boards which had been on display in the WGS Hall . My theory is that they were quietly 'disposed of' as being, in current parlance, politically incorrect. If anyone knows differently, I'd be very glad to be corrected. 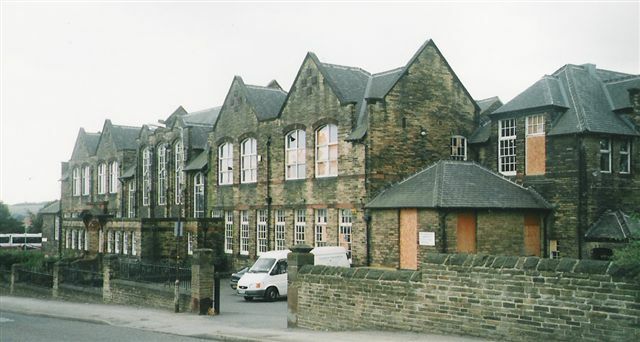 The site at Woodhouse was the subject of many planning ideas and, gradually, all buildings apart from the main school one were demolished. The building was used for community and adult education and for use by local community groups. On a tour round in 2002, the interior was still in quite good order and the 'crocodile and monkey cages' referred to in the main history article were still there, now with their own jungles. Eventually, planning decisions were finalised and the bulldozers moved in to prepare the site for a retired people's complex with residential and community accommodation plus restaurant, shops etc. The developers kept to their promise and conserved the stained glass windows from the Hall, incorporating them into the new structure. Moreover, a plaque including the WGS badge was placed in the foyer and this was unveiled by Jessie Baston in 2008.